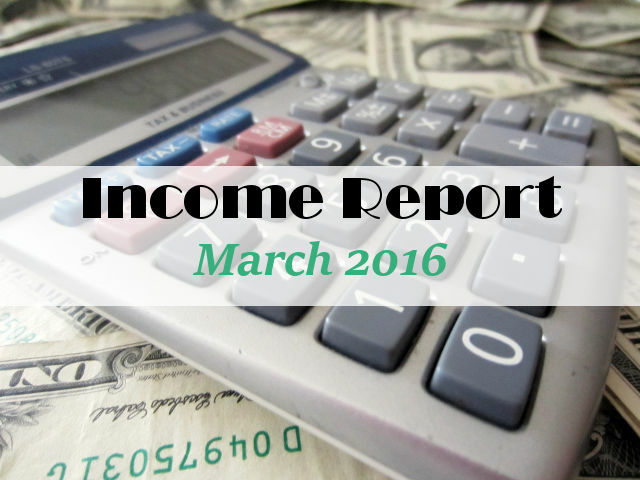 Welcome to our March 2016 Income Report. We are going to continue with our format we started last month, first outlining our ups and downs for the month. We both think it is important since there is no such thing as a month (at least in our experience) without a little of both. The big news of course is meeting our 2017 goal of hitting $4000/month. But boy did we just squeak that number in: $4003.63 !! Can’t get much closer than that. But we are an amazing nine months ahead of our target so that feels great. Now we have the rest of the year to try to maintain and grow that number and work towards our 2018 goal of $8000/month. Almost seems doable now! We had our first full month on our main money site with the new affiliate arrangement in place. All in all it went pretty well although it has been a lot more work than we anticipated. We have never been so hands on with an affiliate manager before. In fact, because we are small, it is rare that an affiliate manager even reaches out to us. It has been a great learning experience but also time consuming. Darren has also been experimenting more with Digitalocean and feels almost confident enough to move at least one of our slower money sites over to them soon. Also, on the ‘real-life’ front, the housing market has picked up here a LOT and with Darren’s business in the construction industry, his normal work is very busy now as well. Our secondary money sites are still not faring as well as we want but considering we have not had much time to spend on them it is not a big surprise. But as we mentioned in last month’s report, we fixed a glitch in one of our sites that was showing old, cached pages to visitors (and Google) and that hit the site pretty hard. Traffic and revenue is picking back up but not nearly as quickly as we thought. I guess these things take time. We were negotiating on buying another website that made a modest amount of income, currently $300-$500/month. We saw good opportunities to boost traffic and revenue and it could have been a good addition to our portfolio. But we lost out on the deal as we didn’t have the time to fully research the opportunity and someone else put an offer in before we were ready. We were better off letting the deal go than going through with a purchase on something we hadn’t done our due diligence on. Definitely more UPS than DOWNS this month! Traffic continued it’s slow and steady rise in March 2016 with our accumulative pageviews topping 100,000 for the first time. All our sites saw a modest increase in visits this past month which was nice to see. Our visitors still haven’t regained to the peak of January 2016 but that’s fine with us as long as pageviews are going up. My predictions every month are just so darned wrong that I feel I should just stop with them. But I can’t help myself. With Spring here in our primary market of North America, people are likely to be spending a bit more time outdoors and less on their computer. We also have nothing planned for the coming month that would substantially boost our sales. So my best guess is that we will be in the mid to high 3k sales for April 2016 with a possible push towards the $4000 mark again but it seems unlikely. Come on internet Gods, prove me wrong! Yes, the chart is still here… It has become a really good tool for us and even if we some day decide not to include it in our monthly report, I will definitely keep updating it for our own use. Our RPM for March 2016 hit almost $40 from a December 2015 low of under $20. I expect we’ll see pretty much a flat line next month but in our opinion we’re at a good point now and happy to see that continue. Our goal will be to try to keep the RPM level at or near this level. Up would be great but flat would make us happy as well. Another great month, another record broken and another goal reached. While we look ahead to less large increases in sales for at least the short term, we are super pumped about the direction we are heading. For those of you reading our reports for the first time – remember that this is a part-time business for us so there is no reason with some hard work you couldn’t be making this kind of money yourself. Thanks for reading, we really appreciate it! So how many sites is this income from? I haven’t visited your site in awhile and it always reminds me that i’m on track. My business sales has increased thanks to being accepted into the Handmade on Amazon program for my Lace Wig Straps, this has allowed me to ship international which I haven’t been able to do with my Shopify store.. now i’m wondering do I need both but I have so much literature made with the URLs on it possibly enough to last another 2yrs! Keep up the good work and thanks for sharing!